What's a woman to do when their wire wrap just doesn't turn out right? Burn and pound things - wire that is! Feeling a little disgusted at all of the time I wasted the other night on this free wire wrap earring tutorial, I decided to jump right back into my Free Jewelry Tutorials board on Pinterest and see what else I could make. Honestly, that last coiling and weaving effort made me want to pull my hair out, so I thought some heavy gauge copper, a hammer or two and my torch would relieve any residual anxiety. 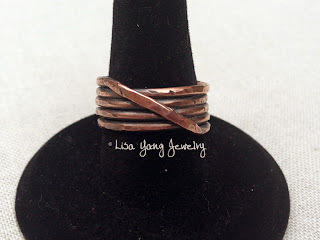 Today's free jewelry tutorial is from York Avenue Studio's Blog. 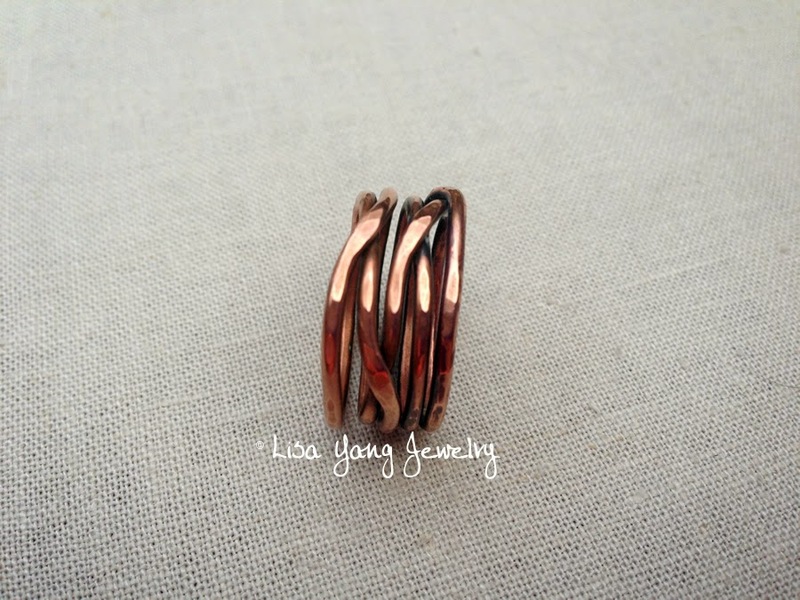 It is for a Bold Copper Weave Stack Ring. The instructions on the tutorial are pretty thorough. If you are making the five row ring - I think you should plan to cut closer to 14 inches of wire instead of the 12 she suggests in the tutorial. 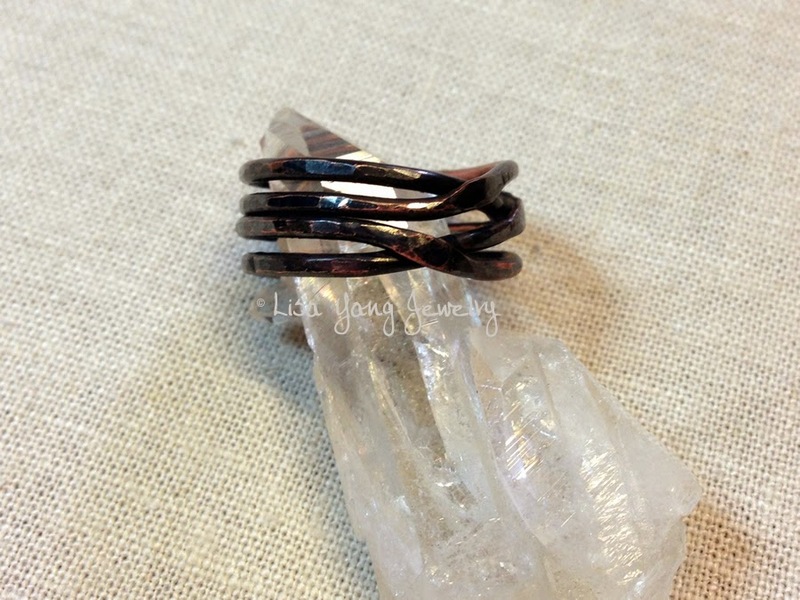 For my first ring, I used 12 inches and I could only wrap 4 times, instead of the 5 in the tutorial. It turns out I like the 4 wraps too, but I would have been very disappointed if I started with silver wire and then found out I didn't have enough. The ring above has five rows like the woven ring tutorial. I showed these rings to my girl friends last night to see what they thought. I came home with two less rings than I started out with. It would have been 3, but all of my rings are size 7 and larger. Actually - that's one thing I should mention. If you are trying to make a ring size 7 or smaller, I think you should probably use 16g wire instead of 14g. 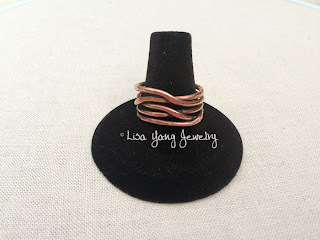 The thicker wire is just too hard to bend that small and keep the ring that size. I'm going to try it today. One other note, if you make a mistake bending and wrapping the wire, or don't like the way it is crossing - you can anneal the wire while it is in the ring shape, quench it, and then unwrap it and start again. If you are not familiar with annealing, it is simply heating the metal which causes it to soften. I heat it until it turns whitish or glows and then quench it in a bowl of water. Then you can unwrap and smooth the wire and wrap again. Until I learned this trick - I would have tossed aside those balls of wire with kinks or waves in them. For at least one of the rings, I must have annealed the ring and unwrapped then re-wrapped the wire 3 times. I decided to try my own style of stacked ring, above. 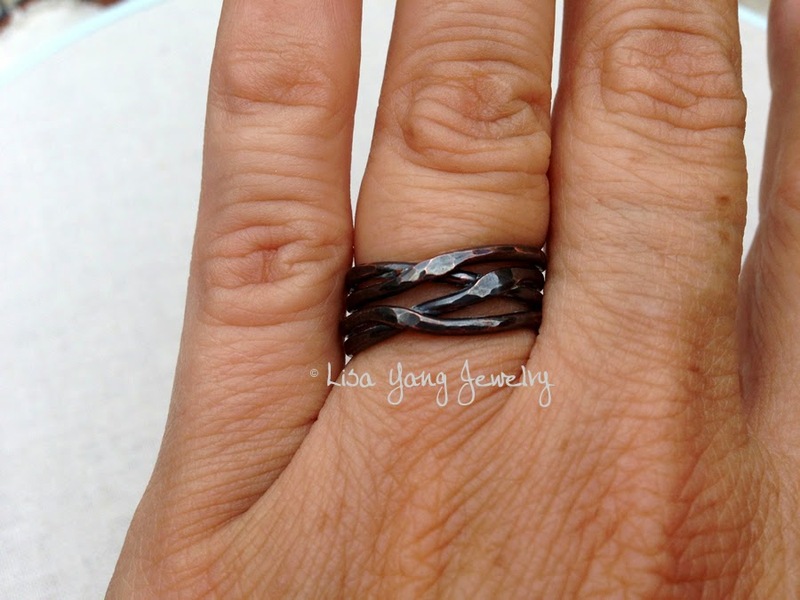 It's simple - but my favorite is still the first one I made - the black patina one. I'm hoping the patina will stay dark like it is in the picture. The patina is from liver of sulfur. Normally, I use steel wool to remove the black on the high spots and leave it in the crevices. This ring I left black and just polished. I'd say it is almost gunmetal with a hint of copper underneath. I applied wax (Turtle Wax for cars) to it to try and maintain the patina and also to see if it would stop my finger from turning green. I've never used the wax before so I am crossing my fingers. Yes, it is a good thought Ron, and many people do that. Eventually, the varnish wears off in spots (it can tend to peel as opposed to just rub off) and it can leave a spotty uneven finish. That is especially true on rings.